Can you fix this curtain, too? Well…I’ll be a snake-head fish uncle! Photo courtesy of Robert Neal. Better get the lampshade fixed before the next party or else uncle fish snake-head will have nothing silly to wear. Well, I’ll be a snake-head fish’s uncle! fish snake heads, fish snake heads, slithery biting fish snake heads. fish snake heads, fish snake heads, eat them up, yuck! The lampshade is broken. No light meals today. The spicy lemongrass soup as recommended by our chef Yoda. therefore the spicy lemongrass soup thinks. The spicy lemongrass soup is what it is. Deal with it. Q. Hey, spicy lemongrass soup, are you really? It’s like there’s a party in my spicy lemongrass soup and all my sea friends are invited. Looks like they totalled up the sea friends wrongly – notice the sticker! Totals up sea friends! The chef must be Aquaman. Waiter! There’s a calculator in my spicy lemongrass soup! Try their seafood – you’ll be de-lighted. I knew I couldn’t trust my slippery snake in the grass uncle! So I broke the lampshade on his head! If you love your friends, don’t set them free…eat them! It’s always the uncle with the lampshade on his head. What a party. Then it will come back to thee. With nothing else to fill it. Ah. The youth of the heart, and your lover in the morning. Chinese snake-head fish uncle didn’t react well to learning he was on the menu, breaks a lampshade in fright. 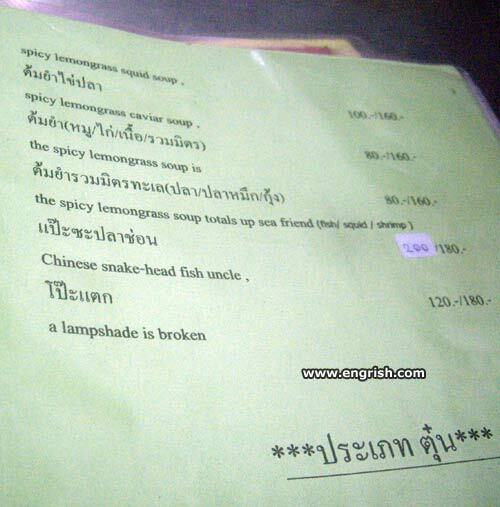 Broken lampshade ends up on menu too because, wtf, it’s Thailand. And the Chinese snake-head fish aunt is . . . served after the Chinese snake-head fish uncle as dessert. I think we all know who broke the lampshade . . .
– Waiter! Where my soup is? – Waiter! Did you sea friend? – No, Sir. The lampshade is broken. – Mommy? My soup is not! The spicy lemongrass soup specializes in corporate tax accounting. The lampshade is broken because a customer passed out while wearing it. Wow! Talk about multitasking your diner is also a house repair shop. Ok I’ll take fried noodles and please fix my faucet too. I’ll take the Chinese snake-head fish uncle please. You know, when the Chinese snake-head-fish uncle gets back from Lowes with the new lampshade.